Fresh light green foliage when young deepening to glossy dark green on maturity, purple-blue flowers in succession growing to 45cm. 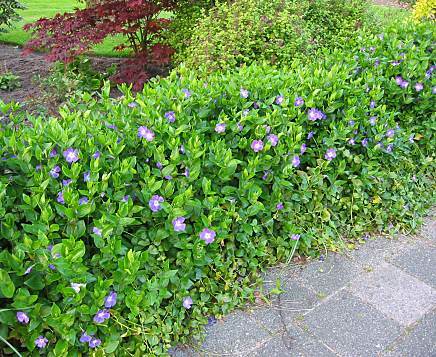 Periwinkle Major is a slender-stemmed creeping evergreen plant from the family Apocynaceae that is a perfect ground cover plant for most areas as it will tolerate anything from full sun to dense shade under large trees and is to be found in southern Europe. The genus name Vinca is derived from the Latin vincire meaning bind, as the long stems were used in the making of garlands, Vinca Major referring to the size of the plant, with leaves growing to 3cm in length and Vinca Minor varieties having smaller foliage. The leaves of Periwinkle Major are light green when first emerging, deepening to a glossy dark green with age providing very attractive winter foliage. The flowers which appear from spring through to early summer are an extremely pretty, purple-blue colour adorning the weed suppressing carpet of growth to amazing effect especially with the arching branches of new growth. Vinca Major is a hardy easy to grow plant however it can be invasive as the creeping nature of the plant means they will self-root where the shoots land. As such they are better placed in larger, perhaps wilder areas of the garden where spreading is not a problem and they will not interfere with other planting. The early spring flowers which will attract insects and bees, will take the plant normally to a height of about 45cm. If the plant is looking a little shabby in winter it can be cut back to encourage new growth in spring. We supply Periwinkle Major as pot grown which means it can be planted at any time of year, weather permitting, so if planting up a new garden it can be done straightaway with no disturbance to the root system. Should you have any queries about Periwinkle Major then please ring one of our team and we will be happy to help.